Shepherd’s Gate Church in Michigan was ready for a fresh new look. 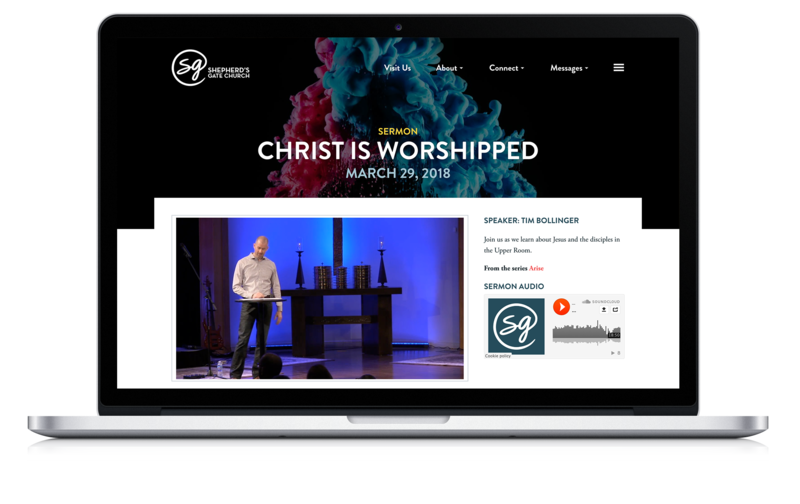 A fun personality, welcoming church culture, and a strong existing brand made for a fun website design and development project. We had a blast getting to know the leadership and communications teams at Shepherd’s Gate Church. Everyone was so personable and friendly, it was easy to see that Shepherd’s Gate creates an atmosphere that feels like home for their members and visitors. As a non-traditional Lutheran congregation in a region dominated by more traditional churches, we helped them create a website that better reflects the fun and family-oriented environment visitors experience. Shepherd’s Gate is very involved in their community, and has many ways for members and guests to get involved through worship, missions, serving opportunities, care groups, events and recreation. We designed and built a flexible grid system that pulls from their brand colors, patterns and photos, so they can easily swap out sections based on changing priorities while still keeping the look on-brand. Let’s talk about how we can partner on your website project.